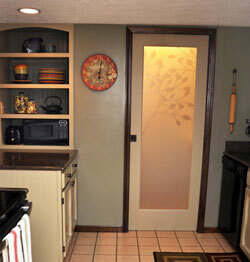 Etched glass interior door features floral design of tree branch and leaves. Shown right as a double door in a gray painted pine frame for example only. Sold Unfinished. 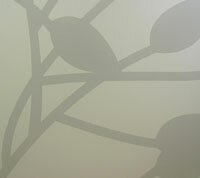 Note that the organic design of the glass is not a mirror image. One side of the glass is etched and the other side is smooth; therefore, the door cannot be flipped to make it mirrored. Acid etched safety tempered glass. One side is smooth and the other is etched. *Note: Our Claremont doors are made using ceramic frit ink that becomes permanent during the glass tempering process. The design actually becomes part of the glass. Some companies use non-permanent air dried inks that are not as durable. They can be scratched or worn off. "We purchased this door about 6 weeks ago. It came less than a week after ordering on line. The was installed last week as a pocket/pantry door. We are very pleased. Have gotten more comments on the door than any other part of the kitchen/pantry renovation. See photos attached below. Thanks for the excellent service and quality." Shown above installed as a pocket kitchen pantry door.